The Mamba's shape and materials feel great in the hand, but wireless comes at a high cost: in dollars, weight, and frequent charging. The Razer Mamba is almost the Deathadder. The 2015 evolution of the Mamba adds new RGB lighting around the sides of the mouse, implements an interesting click force adjustment feature for independent tuning of the left and right mouse buttons, and a new sensor with a max 16,000 CPI. It adds a couple extra inputs with a scroll wheel that can click left and right while dropping the previous Mamba’s two buttons beside the left click. Like the Deathadder, its main buttons have an iconic contoured lip and the sides have grippy rubber pads for great control. The Mamba is almost a wireless Deathadder, but its minute differences, and the added weight of its rechargeable batteries, keep it from matching the best gaming mouse. The actuation force for each button can be separately adjusted to between 45 to 95 grams, with 15 steps of granularity. Razer recommends the lighter force for games like MOBAs where you want to click very quickly, and the higher force for shooters that require more “distinct and controlled” clicks. In my testing, the adjustment really does make a perceptible difference, but I wouldn’t say that it actually affected my playing across a variety of games. I didn’t find the minimum click too soft or easy, and I didn’t find the maximum click too hard. Both were fine. I even booted up Cookie Clicker and timed myself clicking at 45g and 95g. In 20 seconds, I consistently scored in the 120-130 clicks range at 95g, and at 130-140 clicks at 45g. Our intern James saw a similar increase of about 10 clicks in that 20 second window when he tried cookie clicking. Evan and Tom, however, saw opposite results, and Evan and I talked about why; it’s hard sensation to describe, but our theory was that when raising his finger after the click, he was sometimes still applying just enough force to keep the button depressed. That lowered his total click count, because some intended clicks weren’t registering. I think the click force adjustment is a nice customization option to have, but don’t expect it to significantly change your gaming performance. Battery life, too, is better. The Mamba has a rechargeable battery that Razer rates at 20 hours of continuous gaming, versus 12 hours for the Ouroboros. It’s also an improvement from the 16 hours claimed by the previous generation Mamba. That said, don’t necessarily expect to get 20 hours out of the mouse. The 1000Hz polling rate will use more battery life than the default 500 Hz, but if you care about the difference between a 1ms report rate to your PC and a 2ms report rate, the option is there for you. In my testing of the Mamba and many other gaming mice, I’ve never felt a noticeable difference between the two. Using the Mamba as my day-to-day mouse requires some adjustment, because I’m not accustomed to putting my mouse on a charging dock every day when I’m finished using it. With the Logitech G602, my favorite wireless gaming mouse, battery life on a pair of AAs is so good I can leave the mouse on the mousepad without ever turning it off. It goes to sleep, available instantly on wake-up, and drains so little juice, I didn’t have to replace the batteries for more than six months. Despite having the Mamba set to go to sleep after lying dormant for 10 minutes, I had it die on me overnight twice, losing between 25-30% battery life while I was away from my desk. One of those times it was resting on the charging dock, but my work PC didn’t have trickle charging over USB enabled, so it didn’t get any juice while the system was off. I’m glad I can disable the Mamba’s lighting and dial its polling rate back if I want better battery life. Long term, I could get into a habit of charging the mouse when I’m not using it. But with such a massive difference in battery life compared to a mouse like the G602, I’d gladly trade the built-in rechargeable battery for swapping out a pair of AA batteries a couple times a year. Or perhaps adjustments to the Mamba’s sleep mode could help it draw less juice when not being used. As a wireless mouse, the Mamba is only practical as long as you remember to charge it overnight. The Mamba can, however, be used in wired mode, which eliminates battery concerns and lets you go all out with the 1000 Hz report rate and Chroma lighting. At that point, there’s only the question of design, and the Mamba is definitely one of the best-feeling mice I’ve used. As I said at the top of this review, it’s almost a Deathadder in shape and feel, and the Deathadder is as close to perfect as mouse design gets. Despite them being extremely similar, however, I don’t like holding the Mamba quite as much. 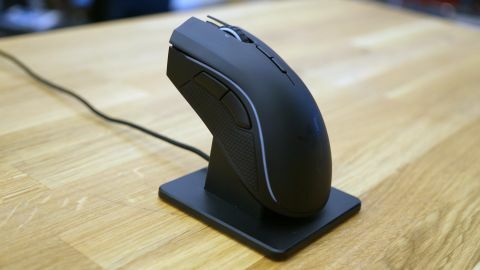 The Mamba has a slightly different arch than the Deathadder, which means that when I use a palm grip on the mouse, my fingers end up hanging over the front of the mouse by a couple centimeters. My fingers hang off the Deathadder a tiny bit less while palm gripping, and the minute difference means that the Mamba doesn’t feel quite as good to palm grip. I have fairly large hands, so for some people this won't be a problem at all. And the Mamba feels great in a palm grip. If you haven’t spent months using a Deathadder, the difference between the two is probably imperceptible, but I don’t like the Mamba quite as much in my hand. Razer still uses the best-feeling materials in the mouse world, though: sweat-resistant matte plastic for the top of the mouse, great grippy rubber for the side panels. The Mamba’s thumb buttons are generously sized, perfectly placed and have a satisfying click. The battery-laden Mamba is a noticeably heavy mouse, weighing over 140 grams. Where the Deathadder is still the obvious winner is weight. The battery-laden Mamba is a noticeably heavy mouse, weighing over 140 grams (about 0.3 pounds). That is a bit lighter than the wireless Logitech G602 at over 160 grams, but the G602 is slightly larger, and thus doesn’t feel as dense. I was actually surprised to find that the Mamba was lighter when I weighed the two. The Deathadder, by comparison, is about 105 grams, and some gaming mice drop below the 100 gram mark. While the Mamba skates very well, its weight is easy to feel in your hand. Based on my own preferences and feedback from professional gamers, I always recommend light over heavy, and the Mamba is most definitely heavy. The 16,000 DPI sensor, as far as I’ve been able to tell, performs excellently. I tested out the Mamba in a variety of shooters, including Dirty Bomb, CS:GO, Killing Floor 2 and Unreal Tournament. I always felt accurate (well, as accurate as usual) and on my game, without a significant adjustment period to the mouse's shape. The scroll wheel is notched well enough to make switching weapons precise without feeling clunky. I also tested out League of Legends and some non-FPS games and found the shape of the mouse and the accuracy of the sensor just as good as it is for shooters. As I mentioned above, the lighter click level didn't make me feel better at these games, but it did feel response for a demanding MOBA like LoL. I performed some unscientific acceleration tests in first-person shooters at my standard of 1,600 CPI, as well as higher CPIs like 8,000, and haven’t noticed any issues with mouse acceleration. I also tested drawing in MS Paint at a variety of CPI settings and didn’t spot any jitter whatsoever in the cursor movement. On my aging Windows 7 work PC, I have experienced some issues with wireless performance, however: occasional stuttery or laggy cursor movement on the Windows desktop. I’ve also experienced the signal seemingly cutting out for a couple seconds, the light beneath the charging dock going dark, and then reconnecting after about five seconds. To give the mouse a fair chance, I also tested it on a newer Windows 8 PC, and didn’t experience any of the same issues. The Mamba worked flawlessly in-game and on the desktop on the Windows 8 PC. I’m willing to blame the issues I experienced on my work PC, but I’ve tested dozens of mouse on it, including quite a few wireless mice, and most of them perform flawlessly. I did experience similar cursor hanging with the Steelseries Sensei, as I wrote about when I tested wireless mice. At $150, the Razer Mamba is a very expensive mouse. It feels like an expensive, high quality accessory, and the ability to work in wireless/wired mode, plus its adjustable click force feature, does stand out amongst the competition. It’s good at being both wired and wireless and definitely the best wireless mouse Razer has made yet—but between its price and the small issues I’ve had with it here and there, it falls short of being the best choice around as a wireless or wired mouse.